[0:01] <redrabbit> the sleepy or the platter? [0:02] <wiselydoesit> i mean at the end of the day its an arduino too right so i can do more things with the things. [0:06] <wiselydoesit> hmm this is cool. [0:07] <redrabbit> the pi platter ? [0:07] <wiselydoesit> yeah the direct solar inputs are just awesome. [0:08] <redrabbit> its a bit expensive ..
[0:10] <wiselydoesit> yeah and wake it up once a day and phone home. [0:11] <plum> anyone use AppArmor on their Pi? [0:13] <hmoney> wireless lan adapter... aka an AP? [0:14] <wiselydoesit> i've had issues with some networks not allowing ssh into and assigning private ips, so i've found its easier to have the pi ssh out to a VPS or something. [0:17] <redrabbit> what kind of bandwidth do you waste maintaining the link when its up ? [0:18] <wiselydoesit> i haven't checked on that. i've got unlimited data, albiet with a FUP but still, tethering isn't allowed but i've found ways around that. [0:20] <wiselydoesit> depending on your locale some providers don't seem to count dnstunnels as traffic. [0:21] <wiselydoesit> yeah i've resorted to an crappy android burner, until i can find a dongle with MTK chipset, i know where i am with MTK chips. [0:30] <wiselydoesit> was actually one of those where i just plugged it in and it worked. was really amazed for £100 of kit. [0:30] <Wetmelon> wiselydoesit: Big ol' pointy antennae? [0:33] <wiselydoesit> but you can watch iplayer on the other end, not in HD but browsing, email and stuff. [0:33] <redrabbit> you didnt iperf point to point ? [0:33] <wiselydoesit> it works stable its the main thing. [0:34] <wiselydoesit> i'd have to check. [0:36] <wiselydoesit> i've been installing the package kali-linux-full on an Pi3, my spare card i'm using is only a Class 10, currently into the 2nd hour. [0:37] <wiselydoesit> yeah, my main cards a Samsung Evo, man am i noticing my moneys worth right now. [0:44] <plum> does anyone know how to decrease the amount of alerts that PSAD puts out? [0:56] <brent77777> does anyone stream 3d iso files using kodi on their rpi? [1:22] <brent77777> does anyone stream 3d iso movies using kodi on their rpi? [2:14] <HeXiLeD> any reason why when editing crontab -e -u user i get 996 and cant edit it ? [2:40] <HeXiLeD> something changed here. is there a shell cmd to set all the default options for the pi ? [2:40] <HeXiLeD> rpi config or sometihing ? [4:44] <trompstomp> would that allow running old dos/windows applications? [5:15] <HeXiLeD> Is there any way to increase the rpi 3 ram capacity ? Mods or addons ? [5:21] <HeXiLeD> Only swap type usb . [5:22] <HeXiLeD> So next question. Can one combine (cloud?) Several rpi' s to increase e erything ? [5:23] <HeXiLeD> Lets say, have 4 rpis working as one ? [5:23] <HeXiLeD> How low ? [5:24] <Sonny_Jim> What is the problem you are trying to solve? [5:25] <ali1234> what do you want to emulate? [5:26] <ali1234> hasnt that game been remade about 100000 times? [5:26] <Sonny_Jim> Isn't tradewars just a drug wars clone? [5:29] <HeXiLeD> Sonny_Jim: even if i run slq in one pi, httpd in another and so on? (Dividing deamons by the pis)? [5:33] <HeXiLeD> how about as a media server? [7:56] <abasar> would buying a Raspberry Pi 3, breadboard, sd card, resistors, jumper wires, LCD display and a few buttons be enough? [7:56] <abasar> or am I missing any key compononents? [8:31] <abasar> Doesn't the Pi 3 come with a power supply? [8:31] <abasar> And what kind of chip? [8:35] <abasar> what kind of supply do I want? [8:37] <ThinkingofPython> My PSU is a Xiaomi PSU, pretty darn expensive too. So I'd personally recommend a 3A PSU if you can find one. [8:38] <abasar> Do you know what hip I might need to drive the LCD Display as Sonny_Jim suggested? [8:39] <kihis> abasar: what display you are gonna use? [8:39] <mfa298> that's going to depend on the LCD display you use. 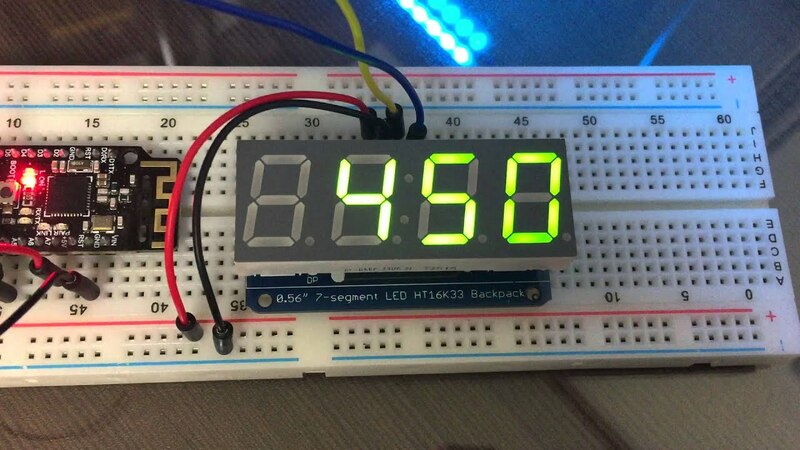 [8:48] <mfa298> if this for an alarm clock (so presumably going by a bed) a character display might be a better option than spi. [8:53] <mfa298> if you do have to write the code yourself the character dispalys are really simple. [9:02] <abasar> So correct me if I'm wrong, what I should be ordering is: Raspberry Pi 3, Breadboard, SD card, Jumper wires, Resistors, LCD display (character or something else), power supply and a few buttons (I can probably find more common electronic components like voltage converters etc. around in my area)? [9:05] <oq> abasar: will it be internet connected? [9:10] <exo-squad> theres some cheap arduino clones. [9:11] <mfa298> zero-w is probably the best option for this sort of project, small, has built in wireless etc. [9:11] <kihis> "NO DONT BUY PI! GO TO ARDUINO CAMP!" [9:12] <exo-squad> simple micro controllers, get an arduino. [9:13] <abasar> actually if the zero-w has built in wireless is there any reason for me to use the 3 over it for a small project like mine? [9:13] <exo-squad> i got a bunch of pi0 for 99 cents at microcenter when they were on sale..
[9:15] <abasar> why would I need soldering? [9:16] <kihis> oh :o where?! [9:19] <exo-squad> reflow oven is too much..
[9:19] <oq> see where I'm going? [9:21] <exo-squad> do you have power? [9:25] <sd-m> oh yeah i still have those ! [9:26] <mfa298> also a good electronics project is never complete. There's a point where it's working which should be followed by adding more features. [9:27] <oq> you need to add a battery backup! [9:31] <abasar> is the battery backup really necessary if it will be connected to the internet and should be powered at all times? [9:39] <exo-squad> i really need to finish my rpi3 gamegear project..
[9:43] <abasar> Do I get female to male or male to male jumper wires? [9:45] <abasar> both are useful for breadboarding? [9:59] <oq> dude, you're in the uk and buying off adafruit? [10:42] <abasar> the one here should be good, shouldn't it? [11:07] <grafi_> my network is is using wpa2-psk (aes), am I missing any magic in my wpa_supplicant.conf file? [11:28] <mal__> Hello, can I get help here with running Chromium on a headless pi ? [11:54] <ryancomet> does anyone know a solution? [12:04] <GenteelBen> And circuit diagrams, and a 90-minute signed captioned Youtube video. [12:20] <ryancomet> so i have to use batteries? [12:22] <pksato> ryancomet: what sw/code is usging? [12:22] <ryancomet> i am using python, what is sw? [12:23] <pksato> can be a wrong pin asingn on python code. [12:23] <mfa298> ryancomet: are you following a guide ? [12:23] <pksato> have at least, two way to address pins. [12:26] <gordonDrogon> BOARD pin 7 is not a PWM pin. [12:26] <pksato> pin 2/1 are on corner, 40/39 near usb connector. [12:28] <gordonDrogon> ok - as long as it's pigpio driving the pin and not really software it ought to work. [12:30] <pksato> led is ok? [12:32] <pksato> the led is lighting using other power source, like two AA battery ? [12:33] <mfa298> silly question, have you got the led the right way around ? [12:34] <pksato> teste led on rpi board. one of legs on pin 6 (or other GND), adn other on pin 1 or 2 (5v), not lit, invert. [12:36] <pksato> RPi is working? [12:38] <pksato> led is a polarized device, need to connect to correct polarity. [12:38] <gordonDrogon> start with an LED. [12:39] <mfa298> ryancomet: a picture of the basic led setup might be very useful. [12:43] <gordonDrogon> tried turning the LED round? [12:44] <gordonDrogon> you might ave using both 5v pins. [12:44] <gordonDrogon> is there a gap between the wires? [12:45] <gordonDrogon> you want physical pins 2 (5v) and 4 (0v) although using 1 (3.3v) would be better. [12:45] <gordonDrogon> sorry - 2 & 6 ... not 2 & 4. [12:54] <gordonDrogon> I still strongly suggest getting an LED going first - using simple command-line tools rather than writing any code. [13:06] <gordonDrogon> let us know how the LED works too. [13:39] <ryancomet> it seems pretty regular, perhaps some kind of interference? [13:59] <ryancomet> is there a way to do it with python? [14:05] <Condor> I'm currently trying to configure Kubernetes on the Pi 3, but it seems to stay idling at "waiting for the control plane to become ready"
[14:06] <ryancomet> no, sorry, kinda new to this. [14:09] <ryancomet> does anyone know why my led wont keep blinking? [14:10] <brent77777> does anyone play 3d iso movies using kodi on their rpi? [14:13] <Condor> ryancomet: connected through GPIO? [14:14] <H__> I need to block the light of the red and green LEDs on the RPI. Any recommendations ? [14:15] <Condor> Why would you want to do that? [14:15] <ryancomet> wrapp the case in ducttape? [14:16] <ryancomet> hmm, little bit of e-tape? [14:16] <Condor> Not sure how to suppress those, but if you do make sure that you get notified about the LED state otherwise! [14:17] <H__> what is e-tape ? [14:56] <brent77777> does anyone play 3d iso movies using kodi on their rpi? [15:14] <L0st> wlan0 connects. I can ssh into it via that. [15:14] <Stromeko> Does anyone know how to get more than one GPIO pin work as a pps-gpio? The current driver and/or device tree setup only allows me to specify one in the config. Also, it cannot be configured to capture both the assert and clear edge apparently. [15:19] <L0st> if that helps? [15:19] <LordThumper> Hey is Rpi's kernel finally mainline? [15:19] <LordThumper> or still not? [15:23] <LordThumper> So patches are still needed? [15:27] <L0st> PING 8.8.8.8 (8.8.8.8) 56(84) bytes of data. [15:28] <BurtyB> L0st, I assume you're using a different IP range on usb0 vs wlan0? [15:28] <Condor> What's the subnets of both those interfaces? [15:29] <Condor> Is IP forwarding enabled? [15:30] <L0st> I haven't tried that yet. [15:30] <L0st> OK, hold up..
[15:35] <Condor> what's the value of net.ipv4.ip_forward? [18:12] <herbmillerjr> Anybody having success with cross-compiling with rpi-tools? I'm getting issues with ICU in the toolchain. [18:24] <RoBo_V> can anyone help with "ffmpeg_avcodec_log: Could not find codec parameters (Video: h264)" trying rtsp stream with motion. what package I am missing here ? [18:30] <hackal> Hi, when you are developing let's say some driver for a sensor do you directly code on the RPi or do you have some kind of "deployment" technique where you code on your local machine and through makefile/script copy the files over the network and run tests? [18:54] <RoBo_V> is there any open source app to be used along with motion ? [18:54] <RoBo_V> open source app --> i meant for android. [19:56] <Chillum> what is the issue? [21:08] <herbmillerjr> "undefined reference to `__cxa_throw_bad_array_new_length@CXXABI_1.3.8'' <-- Anybody know how I can get around this when cross-compiling? [21:18] <Drzacek> will they open anytime soon in EU? [21:18] <JakeSays> i need to get an updated version of a package. building it myself doesnt work. how would i go about doing it? [21:20] <JakeSays> Qatz: there's this thing called ups..
[21:20] <JakeSays> wont ship what? [22:32] <fydel> hi! i have a hamster, a pir motion sensor and 7" display. i want to wake up the monitor from sleep once a motion is detected. any ideas if that can be done via commad line? [22:33] <ball> My daughter has a couple of gerbils, if that counts. [22:34] <fydel> hehe. i mean i want to turn on the monitor if the pi if the hammie moves. [22:34] <ball> What's a hammie? [22:35] <ball> fydel: Is your Raspberry Pi running Linux? [22:36] <fydel> yep. i am running ubuntu mate. [22:37] <fydel> i already get an email once the moves but i also want to turn the monitor back on. [22:37] <ball> fydel: Does "xset dpms force on" work? [22:39] <fydel> it is says "xset: unable to open display "" "
[22:39] <ball> fydel: You may need to specify your display then. [22:40] <ball> clever: Good point. I didn't even think of that. [22:40] <ball> You could ask in #ubuntu-uk too. [22:40] <fydel> ah. great. that worked. [22:41] <fydel> cool! thank you guys! [22:42] * ball guesses that's a good thing. [22:45] <fydel> now i can surveil my hammie even better. djungarian dwarf hamster rights-activists already concerned. [22:46] <ball> Oh! An actual hamster! [22:46] <fydel> of course. humans best friend. [22:58] <ali1234> has anyone used mathematica that comes bundled in raspbian?